There’s a new hot topic in the pediatric world, and it likely comes as no surprise that it involves food! Baby-led weaning is not a new concept, but important nonetheless. Gill Rapley, a public health nurse, midwife, and breastfeeding counselor introduced the term in 2003Gill assessed baby’s developmental readiness for solids at four to nine months of age and observed that several of them were resisting the way they were being fed – rather than the food itself. At four months old babies were unable to pick up their food, but they reached for it anyway. At five months, they started moving food to their mouths, but didn’t swallow much of it; at six and a half months, Gill observed chewing motions, and by nine months the babies were playing with their food less and eating a wide range purposefully. The American Academy of Pediatrics and The Academy of Nutrition and Dietetics recommend introducing solid foods between four to six months of age. In contrast, The World Health Organization recommends that infants start receiving complementary foods at six months of (corrected) age. This is to decrease the risk of choking and to meet nutrient demands that exceed what is being provided by breast milk or infant formula. Baby-led weaning should be introduced at six months corrected age (if baby was premature) in normally developing babies (do not try if baby has muscle weakness of hand/arm/back/mouth), as developmental skills are required to self-feed. 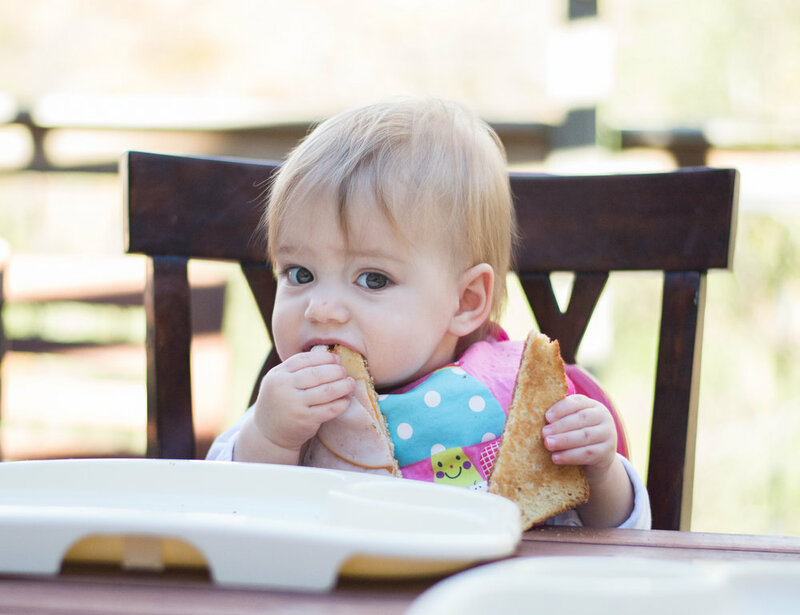 Baby-led weaning is a natural transition from breastfeeding or formula feeding to solid foods. It promotes exploration of food and allows baby to set the pace for eating. The method of introducing solids allows baby to self-regulate, promoting appetite control, and therefore decreasing the risk of becoming overweight later in life. Oftentimes, baby-led weaning offers a more nutritious meal. This is because baby is consuming the same foods that the parent or caregiver is eating, rather than just one specific food per meal. What are the basic principles of baby-led weaning? As always, baby should sit with the family during meals and snacks. The food that is offered is the same food that the whole family is eating, but it’s offered in age-appropriate serving sizes – cut into pieces that are a size and shape the baby can handle (think one slice of avocado). Baby will feed him/herself and is therefore able to decide how much food they are consuming. This method encourages a positive relationship with food and decreases the risk for picky eating as a toddler. A commonly reported concern with baby-led weaning is choking. At six months of age a baby should have stable head control while sitting (no head bobbing), and they should be able to sit independently for greater than three to five minutes. At seven to nine months of age, the emerging tongue lateralization begins, while vertical jaw movement develops. Traditional introduction of solids involves spoon-feeding cereal or jarred stage one fruits and vegetables. Speech language pathologists will tell you that key lingual propulsion and swallowing skills are missed if spoon-feeding is skipped (as in the case of baby-led weaning). Therefore, baby-led weaning can potentially be more dangerous than introducing solids in a traditional way. After reviewing the research and talking with other experts in the field, it is best to start to spoon-feed at six months of age for a one-month period to help develop the lingual propulsion and swallowing skills that are needed. Then baby-led weaning can be used as the preferred method of feeding, if desired. A variety of foods should be offered in “sticks” that are two inches long so there is room on either end of the food once baby grasps it. Vegetables should be boiled, steamed, or roasted. Proteins should be tender and cut across rather than along the fibers. Foods that are round or hard such as cherries, grapes, nuts, or foods that are raw/undercooked should be avoided. As always, it’s important to wait at least three days in between introducing new foods, to be able to identify any allergies. The first couple of months of solid food is more for learning, developing skills, and exploration, rather than nutrition. Breast milk or infant formula is still the primary source of nutrition for the first 12 months of an infant’s life. In addition, the nutrition needs of a baby are different than those of an adult so added sugar/salt is not encouraged.